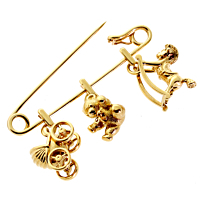 This charming Cartier 18k yellow gold pin carries an adorable assortment of charms that evoke memories of childhood, whether one's own or that of a child or grandchild. It measures 2 inches wide and carries a swinging hobby horse, teddy bear and baby carriage. Imagine the delight of a gift such as this Cartier yellow gold pin decorated with so many smile-inducing motifs!